This Paksiw na Pata recipe is a Filipino original dish made by braising ham hocks in a vinegar, soy sauce and sugar mixture until they're tender and the sauce is gelatinous and thick. Unlike Pata-tim, which uses a whole pig's leg or Pata, the ham hock for this particular dish is just the front section of the leg of the pig. Yes, it packs a lot of flavor but it's mostly pig skin and fat and very little lean meat. 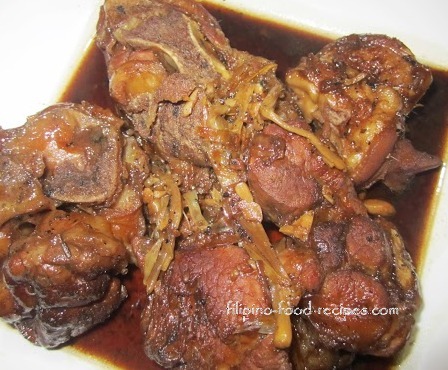 I like Paksiw na Pata with a lot of meat so I use Ham Hocks or Pata mixed with cubed Pork Shoulder. I add the pork shoulder halfway through the braising process so it doesn't disintegrate into the sauce. This way, my family gets to enjoy the gelatinous texture of the sauce, the tender and flavorful ham hock skin plus a lot of lean meat. I use braising method of cooking instead of straight boiling or simmering the meat in the sauce mixture. The process is done by browning the meat first to develop flavor and a rich brown color, then simmering on low heat for an hour. 1 Mix the following together in a bowl : vinegar, soy sauce, bay leaf, oregano flakes and brown sugar. Set aside. 2 Sprinkle salt and pepper on the meat. Heat the oil and sear or brown the meat in batches. Separate the Pata from the pork shoulder. Set aside. 3 In the same pot, saute the garlic and onion, then add the mixture from Step 1 and bring to a boil. Do not stir. 5 Add enough water to cover the meat, then simmer for half an hour. 6 Put in the seared pork shoulder. Add more water if necessary and simmer for another half hour or until the meats are tender. 7 Season with salt and pepper and finish off by adding the banana blossoms. 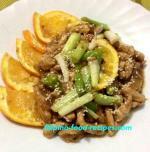 8 Serve with steamed white rice and enjoy! If you want an authentic Paksiw na Pata, leave out the pork shoulder. Just like Adobo, the mixture of vinegar and soy sauce is not stirred so the vinegar gets cooked well and will not taste too tangy.